Archimedes was a Greek mathematician, philosopher and inventor who wrote important works on geometry, arithmetic and mechanics. Although few details of his life are known, he is regarded as one of the leading scientists in classical antiquity. He used the method of exhaustion to calculate the area under the arc of a parabola with the summation of an infinite series, and gave a remarkably accurate approximation of pi. He also defined the spiral bearing his name, formulae for the volumes of surfaces of revolution and an ingenious system for expressing very large numbers. 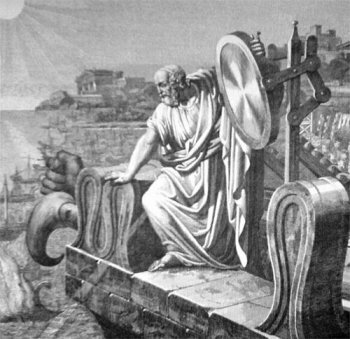 Archimedes was born in Syracuse on the eastern coast of Sicily, (287 BC – c. 212 BC) and educated in Alexandria in Egypt. He then returned to Syracuse, where he spent most of the rest of his life, devoting his time to research and experimentation in many fields. In mechanics he defined the principle of the lever and is credited with inventing the compound pulley and the hydraulic screw for raising water from a lower to higher level. He is most famous for discovering the law of hydrostatics, sometimes known as 'Archimedes' principle', stating that a body immersed in fluid loses weight equal to the weight of the amount of fluid it displaces. 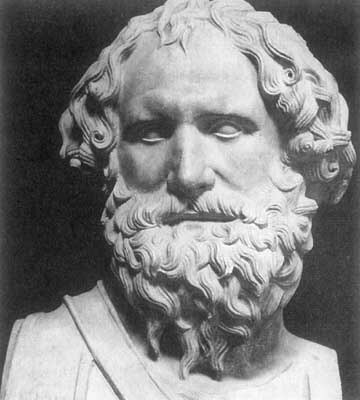 During the Roman conquest of Sicily in 214 BC Archimedes worked for the state, and several of his mechanical devices were employed in the defence of Syracuse. Among the war machines attributed to him are the catapult and - perhaps legendary - a mirror system for focusing the sun's rays on the invaders' boats and igniting them. 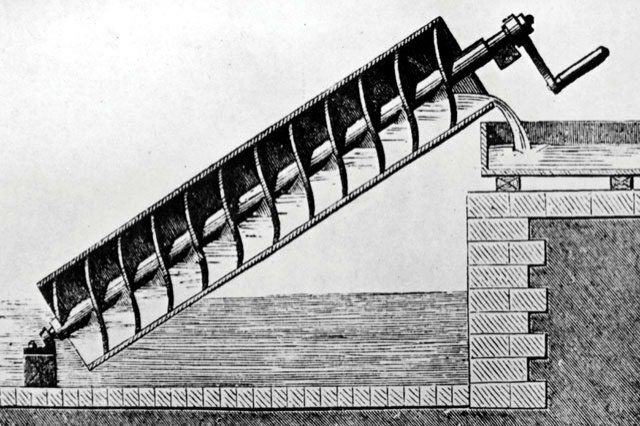 This 'heat ray' is believed to have worked by using a large array of highly polished bronze or copper shields acting collectively as a parabolic reflector to focus sunlight onto a ship. A test of the Archimedes heat ray was carried out in 1973 by the Greek scientist Ioannis Sakkas. The experiment took place at the Skaramagas naval base outside Athens. On this occasion 70 mirrors were used, each with a copper coating and a size of around five by three feet (1.5 by 1 m). The mirrors were pointed at a plywood mock-up of a Roman warship at a distance of around 160 feet (50 m). When the mirrors were focused accurately, the ship burst into flames within a few seconds. The plywood ship had a coating of tar paint, which may have aided combustion. This coating of tar would have been commonplace on ships in the classical era. After Syracuse was captured, Archimedes was killed by a Roman soldier. It is said that he was so absorbed in his calculations he told his killer not to disturb him. 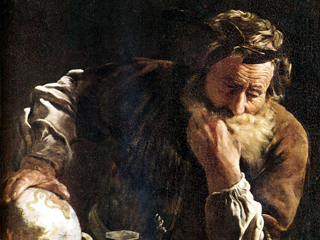 Unlike his inventions, the mathematical writings of Archimedes were little known in antiquity. Mathematicians from Alexandria read and quoted him, but the first comprehensive compilation was not made until c. 530 AD. Likewise, relatively few copies of Archimedes' written work survived through the Middle Ages. However, those that did were an influential source of ideas for scientists during the Renaissance. Furthermore, the discovery in 1906 of previously unknown works by Archimedes in the Archimedes Palimpsest has provided new insights into how he obtained his complex mathematical results.